It just occured to me that I never got around to posting any pictures of my feeble attempt at decorating for Christmas this year. I'll be putting everything away tomorrow, so...here are few. Not all folks make resolutions on paper, but I think that most, at least think about it as a time to make changes. Some of us, (like me) use the new year to really reflect on our daily lives and what we can do to make them better. Bill and I are planning a quiet evening at home. He's been out of town again this week and he's a little tired. And I think I might be coming down with a cold or something. I went to bed last night not feeling well at all and woke up this morning not much better. I am making steaks and shrimp for dinner ( a tradition for us on New Year's Eve) and later we'll watch a movie, have some wine, cheese and crackers to welcome the new year. Sounds boring to some, but we love it. Well, I have rambled on and on more than I had planned. So, I'm going to wish everyone HAPPY NEW YEAR and best wishes for 2009! Be safe and be happy! Several weeks ago, a friend and I were talking about what we would like for Christmas this year. We both agreed that we would really love to get something that would Wow us! Or at least we would think WOW when we opened it. I told Bill about the conversation and the hunt was on!! After being together for 30+years, it's a difficult task to come up with something for me, period. He started asking questions and looking at all the sale papers on Sundays. We did this for several weeks, and even went out shopping together several times and I still couldn't think of anything that I wanted. I couldn't come up with anything and the poor guy didn't have a clue. He went out of town on business the week before Christmas and apparently went shopping there. This is what he came up with! I love it and it was definately a WOW! I have always loved hearts and have several different ones that I have gotten over the years. But, this one is really a little more special though....the meaning is different than all the rest! I'll be back soon with some new pictures. Christmas Eve and it's after 9:00............you'd better be ready cause the big day is tomorrow! All the hustle and bustle and it's over so quickly. I wish (so much) that it could last longer. Such a wonderful time for me; I love shopping, cooking, crafting, wrapping presents, even watching all the corny Christmas movies, old and new! We spent the afternoon/evening at my parent's house with my family. We had a huge meal with fried turkey, baked ham and all the fixens! My Mom made two of her famous chocolate cream cakes! So yummy!!!! I don't think I'll eat again for days. It was so nice this year. It's always a little hectic there when we all show up at once ( 25 or so), but today, we kinda showed up in shifts. My brother didn't make it at all...he was still working in Florida and decided to wait and come home for New Years instead. We missed him, but we're going to try and get together for a meal or at least a visit on January 1st. One of my favorite gifts today were little ornaments made by my great-nieces. Shyann (2) and Skyler (5) put their (snowman) fingerprints on shatterproof balls along with a little poem explaining about them. Just too precious!! When my hand was just this small! Tomorrow, I'll make a big breakfast and we'll have a leisure morning. Then we're off to Graham to have lunch with Bill's Mom and brothers. Not nearly as chaotic as my family, but still really nice. Later in the afternoon, we'll spend time with the Grandkids. A busy day, but it's over way too soon. I want to wish everyone a very Merry Christmas and all the best for 2009! Tired of Ham & Turkey??????? I ran across this recipe the other day and thought I would share....it's very easy and very tasty after eating ham and turkey for days as we do in NC. I have made this off and on for years just to have a change. It's a little different than just regular spagetti. My kids used to love it on the 26th or 27th of Dec. A bag of salad greens and garlic toast and you have your meal. Brown first 4 ingredients in shortening. Sprinkle with salt; stir in water. Bring mixture to a boil, add spagetti. Cook, uncovered 12-15 minutes or until spagetti is tender. Stir in tomatoes and ketchup, simmer about 10 minutes to blend flavors. Serve with parmesean cheese. As some of you know, I get on these cleaning binges and really get carried away. This usually happens after I have been to the doctor and want to make sure that everything is in order! LOL !! Nothing like a doctor's appointment for me to get my closets cleaned out and organized!! The paradox of our time in history is that we have taller buldings, but shorter tempers; wider freeways, but narrower viewpoints; we spend more, but have less; we buy more, but enjoy it less. We have bigger houses and smaller families; more conviences, but less time; we have more degrees, but less sense; more knowledge, but less judgement; more experts, but more problems; more medicine, but less wellness. We have multiplied our possessions, but reduced our values. We talk too much, love too seldom and hate too often. We've learned how to make a living, but not a life. We've added years to life, not life to years. We've been all the way to the moon and back, but have trouble crossing the street to meet the new neighbor. We've conquered outer space, but not inner space. We've cleaned up the air, but polluted the soul. We've split the atom, but not our prejudices. We have higher incomes, but lower morals. We've become long on quantity, but short on quality. These are the times of tall men and short character;steep profits, and shallow relaionships. ( This part isn't true for today, but) These are the times of world peace, but domestic warfare; more leisure, but less fun; more kinds of food, but less nutrition. These are days of two incomes, but more divorce; of fancier houses, but broken homes. I would like to think that I can and do make a difference, at least sometimes. I was sitting here last evening with my friend, Retha and Kathy from Just Plain Country ( I have a booth there ) called and told me that part of the building had collapsed! Thank God no one was injured! But, it is devastating for Kathy & Tim. At this point, we can't even get in there to get our "stuff". They are having engineers come in this morning to check it out and hopefully they can fix it quickly. The building is around 100 years old so there's no telling what they might find. My thoughts and prayers are with them and the folks that work for them....I'll let you know what happens. I just finished this up and wanted to see if I could get some opinions! This will be new for 2009 on my web site. What do y'all think? I was looking for something to sit on my stove top and a daughter, of a friend of mine, Miss Lauren, suggested this! I love how it turned out! The winner from my Web site monthly contest has come forward. I had almost given up on her! LOL! Kathrine Oakley from Sumter, SC. I'll post pics as soon as she makes her selections! 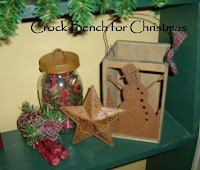 Come on over and enter December's drawing! No purchase necessary! 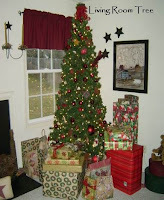 Tomorrow is the DAY....that I am going to get my main Christmas tree up and decorated!!! In the morning, I am going shopping with my Mom & Dad so they finish up some shopping, but basically I am all done!! I know a lot of folks are waiting to hear who the winner for the November contest was...I picked a winner, but she hasn't gotten back with me yet. I will give her a few more days and then I will pick someone else. Just wanted to give her ample time in case she was out of town, sick or something. As soon as I get caught up on orders, I'll be back here posting and sharing as much as I can. The Christmas orders have been a little overwhelming for me this year and I had to make TODAY the cut off for Christmas delivery. I feel so blessed to be so busy, but sometimes I wish I had a little crew of Fairies to help me. Folks are really looking for and asking for the made in USA goodies. Next year, we are really going to focus on those types of items, plus more custom and personalized products. My homemade Room Sprays are one of the most popular items that I am selling at the moment! Folks are lovin' these! The scents are fabulous! And they make great gifts! I can actually personalize the label! This is a special order that I did for a customer. You can't imagine how CUTE this lantern looks with the greenery and the grungy pillar. It has glass on the front and will sit or hang. Just wanted y'all to know that I am still around and until next time. We all have so much to be grateful for this year and I think it's nice to have a chance to really think about it! I AM so blessed to have met so many wonderful folks on line and to have the success with my site that I have had this year!!! My life would not be the same without each and everyone of y'all! We would never have met without the Internet, so I suppose we should all be really thankful for that. LOL! It has been a while since I've posted and I can't believe the grief I get for it. It's such a busy time of year for me and sometimes I just can't get around to doing everything that I should. But, hopefully I can get back to it on a regular basis soon. It really is a lot of fun! I didn't cook at all today...Bill & I went out for turkey and dressing. We are going to have our family Thanksgiving tomorrow with the kids. It was such a beautiful day today so we decided to go out and do a little shopping together. I was looking for burgandy decorations. This year, I want to change out all my Christmas red to burgandy. It's a lot harder than I thought it would be. 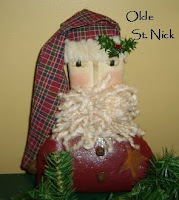 All the decorations will be coming down from the attic soon and I'll post some Christmas pics. Never got around to posting last months contest winnings, but here they are now! 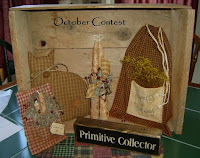 And there's still time to enter November's contest. Marjorie chose these goodies for her gift certifcate. Enjoy! And Karen chose soap balls and grungy tea lites for hers. Look for most of these on my web site soon! Wow! I can't believe it has been soooooo long since I have posted. To be quite honest, I just haven't felt like doing much for a week or so. But, I am feeling better so I thought I would just post some pictures. That's easy enough and I don't have to use much brain to do it...........LOL! 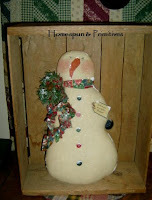 This is a paper mache Saltbox house that I made for myself to go in my Living Room. This is my bookcase corner. As you can see, we have lots & lots of books! We all love to read and collect! 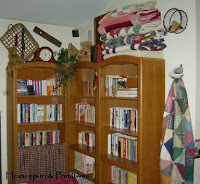 The top of the bookcases are filled with some of my quilts, antique baskets, couple of my handmade bears, a very, very old level that was my Grandfathers'. The small quilt on the wall is one that I made. Top view where you can see another one of my Alladin oil lamps and a chess board that my hubby made 30 or so years ago from a circuit board. He even made the frame from some really wide moulding! It is really quite unique! Well, that's about it for now. But, I'll be back soon! A Few Plans For The Rest Of The Week: A doctor's appt, going to Walnut Cove and another trip to Pilot Mountain. I found these to add to my collection on a recent Prim shopping trip. 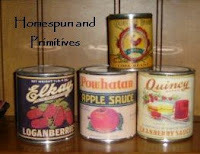 They are reproduction labels, but they are sooo nice on the hutch in my kitchen. 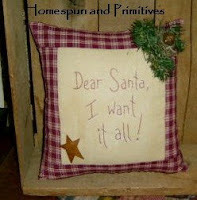 http://www.prim-folk-friends.com/store/Default.asp. Judy invited me to join so I am already there! The Alladin oil lamp was one of the first things that my husband bought me after we were married, over 30 years ago. It has been everywhere with me over the years, in every house and every move. And to this day, it is still one of my favorites! This is a fabulous store that I found while I was there. Sherrie, the owner has done a wonderful job of finding great prims. The store is full of old and new treasures...and I didn't have any trouble finding a few things to bring home with me. This is the front window that was perfectly decorated! I would love to duplicate the look for my own front window! LOL !! My hodge podge purchases! 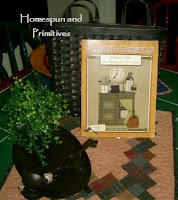 A black basket to put almost anywhere, prim greenery, an iron flat skillet, a fabulous tea dyed mini quilt, a set of iron spoons and Mercantile Gatherings magazine plus a few other things. This is only a sampling of what's available. If you are ever in Pilot Mountain, look up Pilot Mountain Peddlers. It's well worth the stop. I'm going back REAL soon!! 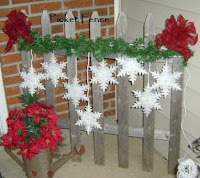 $30.00 Gift Certificate ~ Marjorie Ford of Boardman, Oregon. 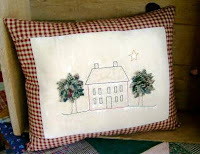 $20.00 Gift Certificate ~Karen Martinsen from Wisconsin. Congratulations, Ladies! And to Everyone be sure and enter Novembers' Contest! A Few Plans For The Rest Of The Week: work, work, work! has sent me this very special award! Thank you so much for thinking about me. Pam and I have known each other for quite a while. 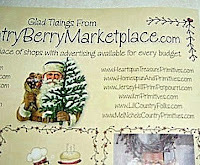 We met thru my web site where she has purchased items for her store. Thans so much, Pam! Now on to the nitty-gritty.....I need to answer a few questions and then pick a few folks to share it with. 1. Do you have the same friends since childhood? Not really...and it is a shame. Shortly after Bill & I were married we moved to the mid-west and at the time it was really hard to keep in touch. Would have been nice to have the Internet way back then. 2. What do you value most about your friends? Just the fact that they're there. Sometimes you just need someone on your side and I know without a doubt that I can depend on that! 3. Are your friends sounding boards? Just about everyday! Maybe I should leave it at that! LOL!! 4. What is your favorite activity to share with friends? Right now, I would have to say crafting and creating. I have found this to be very rewarding for me. I'll be back later. Until then. Hope everyone is having a HAPPY and SAFE HALLOWEEN! The morning started out quite chilly in K-Ville, but as the day progressed it was warm & sunny. And tonight was perfect for the trick or treaters! We have actually had several this evening. Gave out lots of treats to the little ones. They are so cute and soooo very excited! 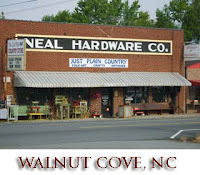 I went to Walnut Cove bright and early this morning with My Mom & Dad. 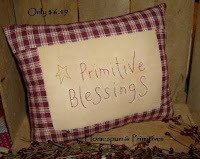 They have decided to get a booth at Just Plain Country and sell some Primitve Wares. They have some fabulous goodies and I can't wait to see how they do. And to make things even better, their space is right beside of mine. We also went to Stuart, VA to the second location of Just Plain Country. 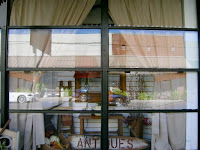 It is a huge store filled to the brim with antiques and all kinds of collectibles. It was a really nice drive up there, curves and all. There were still lots of Fall colors. Wish I would have taken my camera. The trees were just beautiful! This is my Friday Favorite Find for this week...a very old , extremely long handled, iron skillet. Actually found this today in Stuart and just had to have it. I think it is fabulous. Haven't decided where it is going to live yet, but thought y'all might want to see it. Overall, it's about 50 inches tall, yep 50 inches! It's a very unique piece and I have to find just the right spot for it. That's about all for now. Gonna watch the Starter Wife on USA in a little while. It's another one of my Friday Favorites. LOL! Hoping everyone had/is having a great Thursday! I spent most of the day working on orders and trying to organize some of my patterns in my craft room. It gets a little scary in the craft room sometimes when I don't clean up after myself! It seems that I am always in a hurry lately, and just kinda "GET BY" with cleaning in there. So much easier to close the door and clean another day! But, another day has arrived and it seriously needs some attention! This is the Special of the Day! Thanks for stopping by & be sure and sign my guestbook if you haven't done so already! 1. I can't stand for my food to touch. 2. I always park on the same aisle when I go shopping. 3. Every day I wear RED! 4. I'm left-handed, but do almost everything right-handed! 5. I am supposed to wear glasses. 6. I used to do home parties with my crafts. 7. I love STAR-GATE SG1 & Atlantis on the sci-fi channel. If you get a chance, Stop by and say HI! Wednesday Web Site Special only $4.49 set! Candy cane that I made ( actually just covered with grungy muslin & homespun) yesterday, but couldn't decide how to decorate it. This is what I came up with....greenery, berries, moss and even some holly leaves. 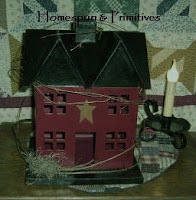 The grungy tag says Homespun Holidays. I would love to put these on my web site, but I think it would be a hassle to ship them because of the size. They are sooo cute though. What a day I have had, so until next time. I think it's Wintertime in K-ville today. Fall has suddenely disappeared. It has really turned cold and a little breezy. We finally turned on our heat last night. I thought I was to freeze, the low was like 32 degrees or so. Only $9.49 for a limited time. You never know what it'll be next time. I have some other rather exciting news! 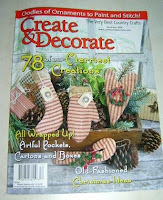 I have another ad in Create and Decorate magazine! Not sure when it came out, but I bought my issue yesterday. Diane did a fabulous job with the lay-out. I can't wait to do another one, only bigger next time! There I am in the right upper corner! A Few Plans For The Rest Of The Week: Just sewing and crafting, going to Walnut Cove and the grandkids spending the night later in the week. 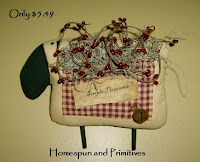 Saturday's Web Site Special is this really cute prim sheep! 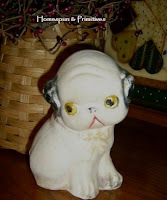 Too cute hanging on the wall or sitting on a shelf. Working hard today to get as much done as I possibly could. I think I have been busy most of the day since we got back from breakfast. First of the week, my son-in-law may have to have surgery and I'll be watching Alex and Miss Elle. I can't get much done when they are around, but family comes first! Hopefully, he'll have a speedy recovery! Today, started out a little dreary, but cleared off this afternoon. I decided that a pot of homemade vegetable beef soup would be perfect for this weekend. We can eat on it several times, then freeze the rest. We had some a little while ago and it was really good! I took a few more pictures of the outside of my house today. I really will miss the Fall decorations when it is time to move on. The mums have been beautiful this year and I really should have planted them, but didn't have a clue how to do it. Maybe next year. I still have a little bit of work to do in my craft room, so until next time. It tried to rain almost all day today, but it never really amounted (is this a word?) to anything. I started my day by taking the garbage to the curb for pick-up. It was cold and wet and I really didn't want to participate, but I had so much "stuff" in the garage that Bill doesn't know what stays or what goes. So, it was my job to do it today. And after waiting until the last possible moment, I got everything gathered up and out the door. But, my point is...when I was walking down the drive, I had to stop and listen. There must have been hundreds of birds in my trees. And they were all talking to each other. It would be interesting to hear what kind of story they would tell about a cold, wet Friday! I stood and listened for a few minutes with a smile on my face and then scambered back in my house for another cup of coffee. It was a good start for my day! First of all, I want thank everyone who has made a comment or signed the guestbook here or on my web site. They all mean more entries in this months contest! And it is so fun to see who says what or who signs the guestbooks! Tonight, Bill & I had some fabulous brunswick stew for dinner. He stopped on his way home and picked it up along with hushpuppies. It was such a good day for it. By the time Thursday rolls around, we are both so tired that we just want to chill for a while and go to bed. LOL! I am changing the special every day until Halloween! So check it out. You never know what it might be! 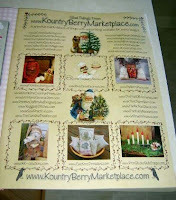 There's a couple of new Christmas items that I am getting ready to put on my site , so look for those as well! Lots to look at and I look forward to hearing from you all!